Even though the dying pet was in a pitiful state she still managed to wag her tail while being treated at an animal hospital. Sadly, the mastiff-cross was in such a poor state that vets decided they had to prevent any more suffering by putting her to sleep. 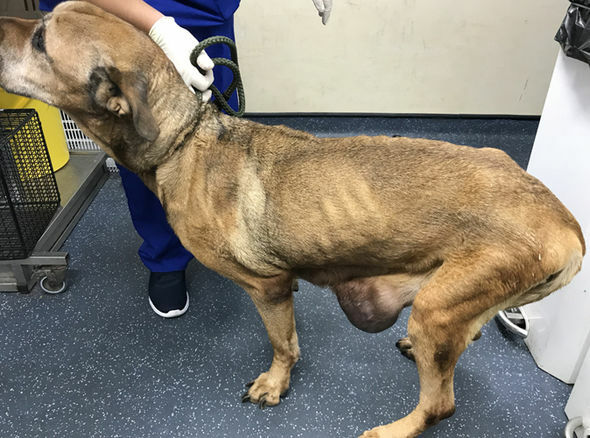 An investigation has now been launched to find out who dumped the emaciated pet in Liverpool last weekend. 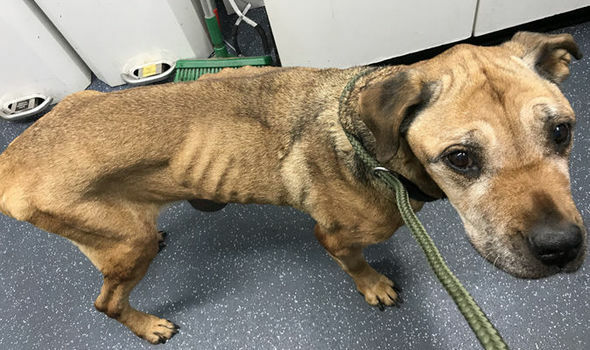 RSPCA animal collection officer Kelly Nix rushed the emaciated dog to the charity’s Greater Manchester Animal Hospital, but feared the worst the moment she saw the discarded pet. ACO Nix said: “When I first saw her I could tell she was in a bad state. She was emaciated, had a tumour the size of a football on her stomach and two smaller ones, she couldn’t stand and was unable to hold her bladder. “The team at Greater Manchester Animal Hospital found she also had burns down the back of her legs consistent with her lying in her own urine for a long period. “During treatment she kept fitting and, sadly, they were unable to save her so the decision was made to put her to sleep. The tan-coloured dog, aged around nine, was not microchipped and there have been no reports of a missing dog fitting her description. Some people want stringing up. There would be many people who would volunteer to do it. So sad and so unnecessary . Maybe what goes around comes around.